If you own a small business, or are a household employer, and want to offer a retirement savings plan to your employees the options can get confusing. Offering a 401(k) can be complicated and expensive, but a SIMPLE IRA might be just right. 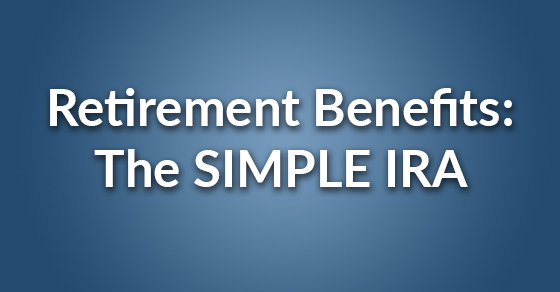 What is a SIMPLE IRA? Here is a breakdown of how they work and some SIMPLE IRA benefits. Non-elective contributions of 2% of an eligible employee’s compensation. Employers can deduct their contributions and employees can contribute pre-tax, so payment of taxes is deferred until distribution. With a SIMPLE IRA, employers also avoid non-discrimination tests. These tests involve calculations across all employees of an organization and may limit contributions of higher wage earners depending upon the participation level of those earning less. There are deadlines for having a plan in place, so if you are thinking about it, acting sooner is always better than later. If you have more questions about how these accounts work please reach out to a financial institute that offers them, or an accountant specializing in retirement savings.